Photo 1. English grain and bird cherry-oat colonies on rye leaf. The 85% stems infested action threshold accounts for infestations of cereals by multiple species. The smaller, dark, bird cherry-oat aphid often colonizes leaf sheaths at the base of the plant. 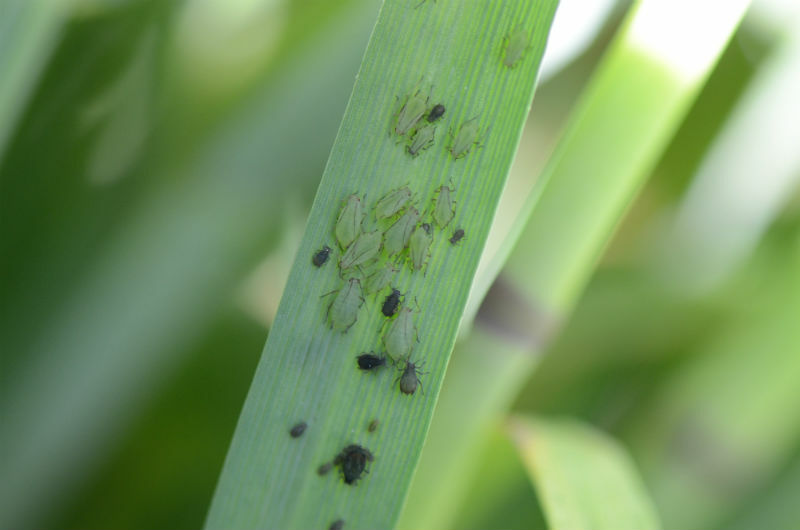 Include aphids in your wheat, barley and oat scouting plans this season. Both bird cherry-oat and English grain aphids have increased dramatically in SW Minnesota the past week. This is the most dramatic early-season infestation I have observed in 19 years at the UMN Southwestern Research and Outreach Center (SWROC). Winter wheat populations reached the treatment threshold of 85% of the stems infested, and we are treating variety trials at the SWROC. This does not mean all fields or areas have high aphid populations. Aphids have started to move to 1-2 leaf spring planted grains, but at this point, I am finding aphids mostly on oats planted near winter wheat, barley and rye. These two species also colonize corn later in the season. Based on this spring's weather patterns, SW and SC MN are most likely to have received large numbers on immigrant aphids. However, alate (winged) aphids are now being produced and can be expected to move to new areas. Results of assays by Dr. Madeleine Smith, U of MN Plant Pathology found English grain aphid migrants were carrying barley yellow dwarf virus (BYDV) but at a low percentage. We are sending additional aphids, particularly bird cherry-oat, for assay. BYDV cannot survive without live plant tissue or infect new plants without an aphid vector. Aphids must acquire the virus by feeding on infected plants. After a several hour latent period, during which the BYDV virus particles circulate through the aphids body and into the glands that produce saliva, the aphid can transmit the virus to new plants. The virus does not increase inside the aphid, but the virus particles can persist within the aphid for a period of several days. This allows migrating aphids to bring the virus into new areas. The disease is more severe when plants are infected while small. However, at this point, we do not have evidence of a large percentage of aphids carrying BYDV, and there is no reason to adjust economic thresholds.